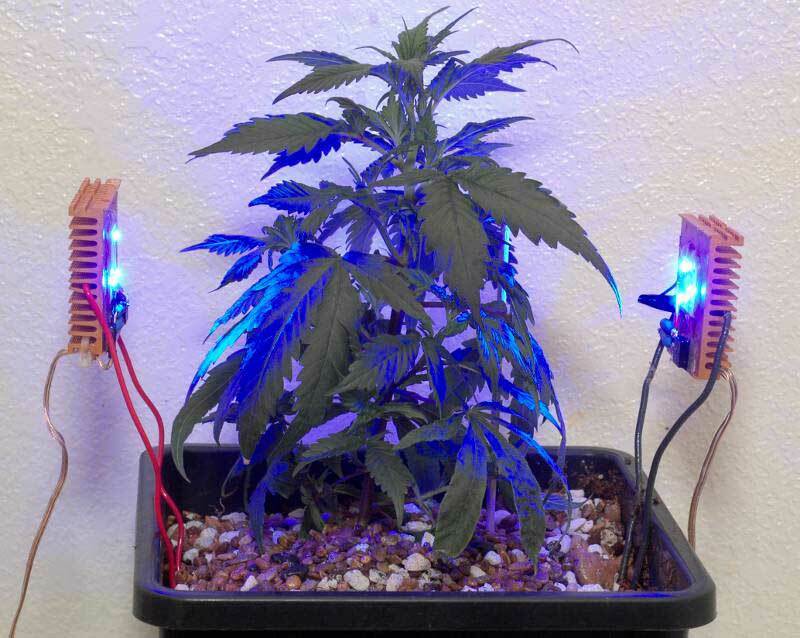 I came across this incredibly interesting article by SuperAngryGuy, an avid grower who has been doing some interesting research into marijuana grow lights and who is kind enough to allow others to repost his work so that the growing community can benefit from his research. 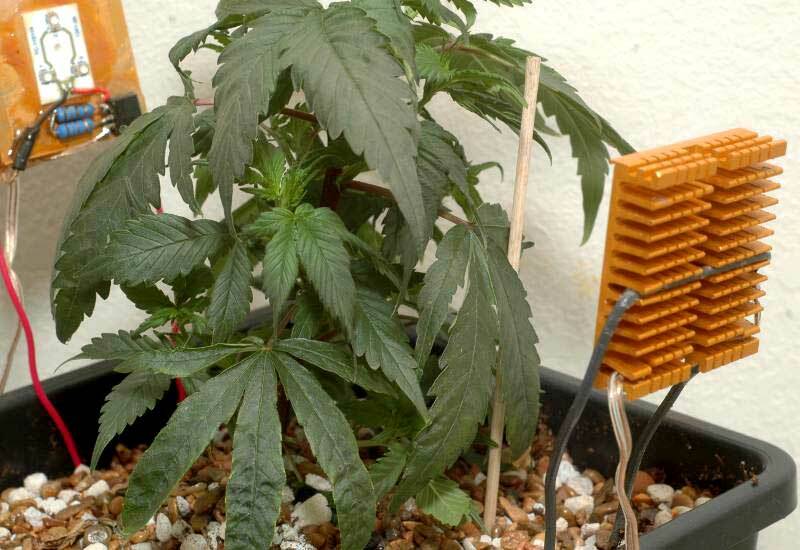 This technique is NOT aimed at the beginner grower, and is aimed at the intermediate to advanced grower who is interested in learning the cutting edge technology of growing and loves getting down and dirty with a little experimentation. If any of you have been using SLT to alter the way your plants grow, I’d love to hear from you! What is Selective Light Training? Selective Light Training is about hitting certain parts of a plant with light for the purpose of protein manipulation. I have yet to run across a LED manufacturer/reseller who has a clue about light sensitive plant proteins. A typical plant will have in excess of 1,000. The phot1 and phot2 Phototropin proteins are what’s being manipulated with blue light. Blue causes plant cells to not elongate (as much) so hitting the stem with blue gives a more compact plant. 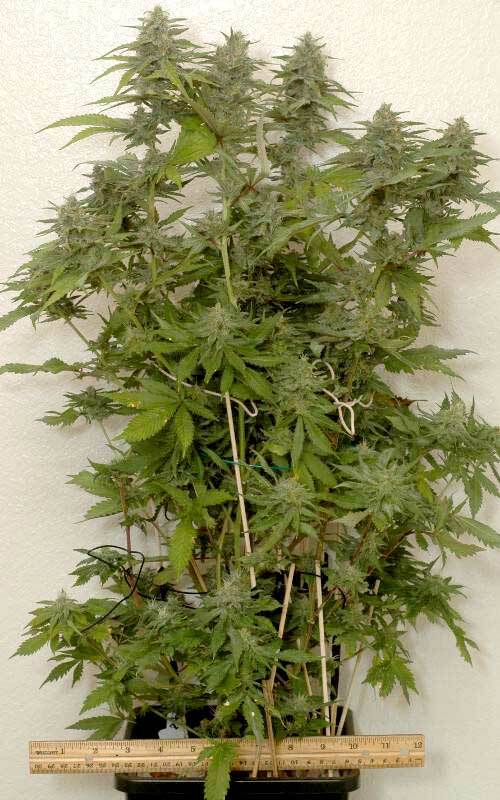 For use on stems, as shown in this young Jack Herer Plant (pictured to right), you have to get the blue LED array up close to the stem with uninterrupted light. That is why I use 20×55 degree oval LEDs. 20 degrees side to side allows a little aiming slop and the 55 degrees vertical insure light overlap. The LEDs can be found here. Use model number 725LB7C. These are cheap Chinese LEDs so you need to under drive them to around 10 milliamps. Putting 3 in series with a 330 ohm resistor and building an linear array allows one to use an unregulated, 12 volt power supply. All of this is to keep costs down (those LEDs are about 3 cents each out of China in quantity). I’ve never seen one of these blue LEDs burn out at the lower power level. To the left is a close up of how the light sticks look and below that is an even closer showing the epoxy encapsulation. These light sticks are simple to build (for personal use only….legal of course), and you should be able to see what you need to do with the pics. 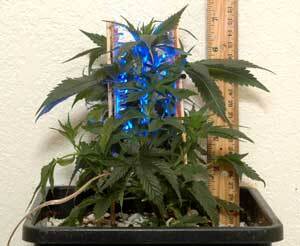 With blue light blasting the stem only, other wavelengths of light can be used on the different parts of the plant. In my experiments with sweet basil, I’ve used blue on the stem and amber on the leaves. 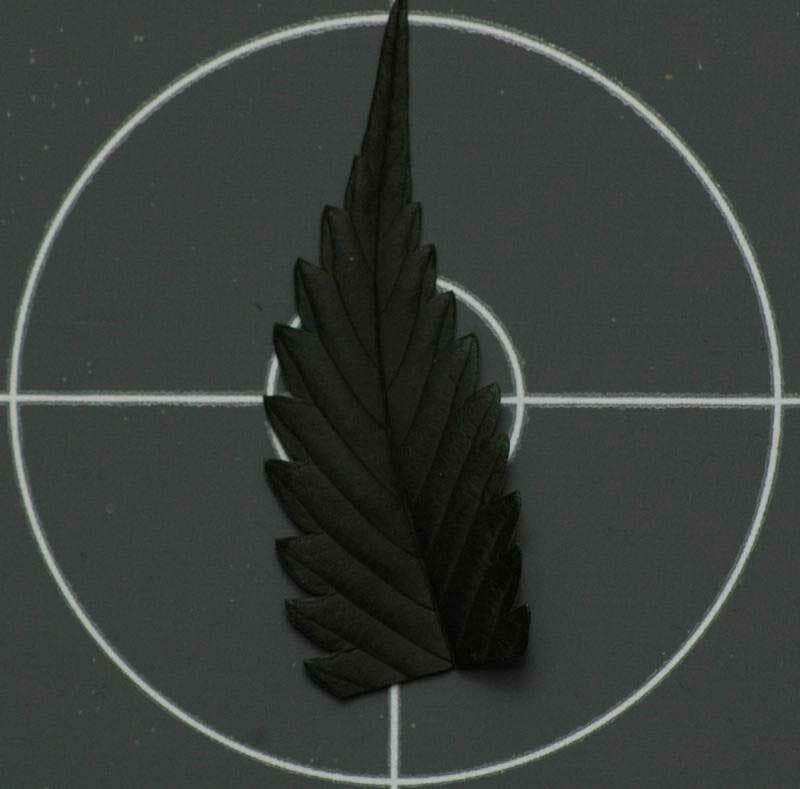 The resulting leaves are 4 times larger than normal. Not all plants react the same way, and results do seem to be strain specific (sweet basil, lettuce leaf basil and purple basil react differently). To the right is a mystery skunk marijuana plant giving to me where I can get 4-5 internodes per inch, even at lower main lighting levels. Excess stem elongation is a thing of the past and you will get significantly more growth per area or volume. For short day plants, use the light sticks for veg growth and the first two weeks of flowering only. Pictured below are two examples of using the light sticks with intracanopy lighting. Notice how there are different light sticks with different light colors being directed to specific parts of the plant. Next to the young plant, you can see what an older plant looks like with about 3 weeks to go, also using intracanopy lighting. I’m expecting +3 ounces per square foot equivalent (this is 2/3rds of a square foot) with this plant but while also using intracanopy lighting. Next is Purple Arrow (pictured to right) that had selective lighting training (it’s a low yielding strain). 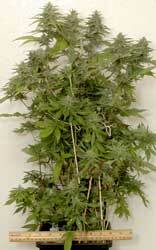 This plant has not been topped and shows how different strains can give morphological differences. The blue light on the stem tends to produce plants that are not as wide but you have to test the strain to see how well SLT works for that strain. 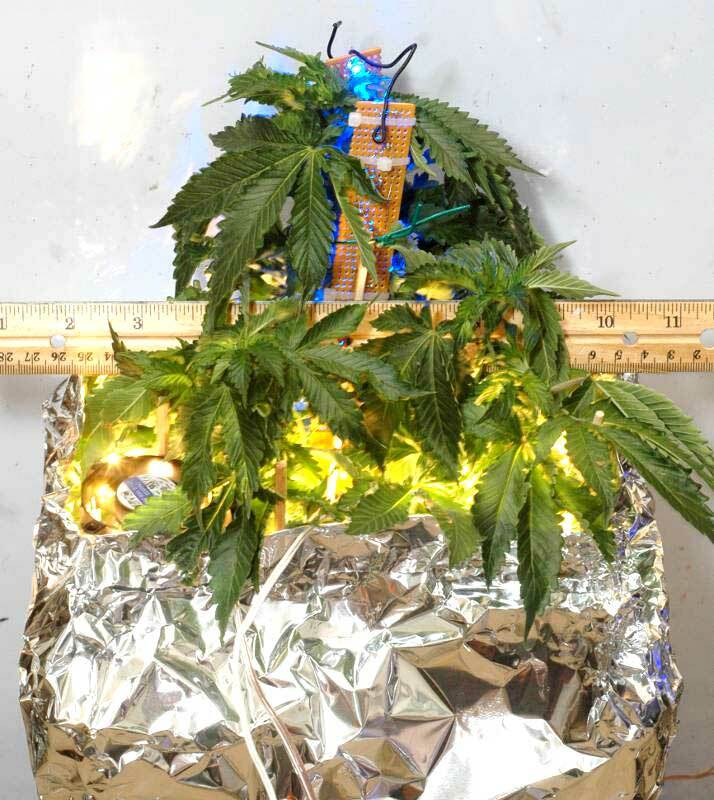 This allows more plants per area and more yield with intracanopy lighting. Intracanopy lighting often requires foliar nitrogen spraying and will produce a higher thermal load in your grow area as well as more humidity from the increased photosynthesis. You can not just use blue side lighting to pull this off. The leaves tend to grow downwards with blue side lighting blocking light from hitting the stem. You must get the blue light in close to the stem which is the difference between side lighting or intracanopy lighting and selective light training. 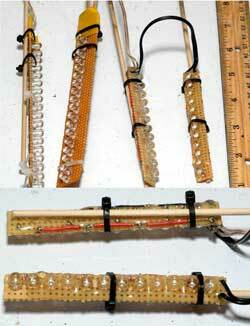 I’ll be adding to my lighting guide soon a primer on LEDs and how to build your own intracanopy apparatuses. Also, I should point out that the blue LEDs only need to be used on the growing parts of a plant (zone of division and zone of elongation). 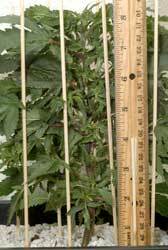 I’ve tested this with hardwoods, like Fuji Apple on a P-22 rootstock, and it does work for making more compact grafts as long as you hit the growing part of a hardwood before the bark has formed. I’m still waiting to try this on coffee tree saplings to try to make a more compact and economically efficient coffee tree. 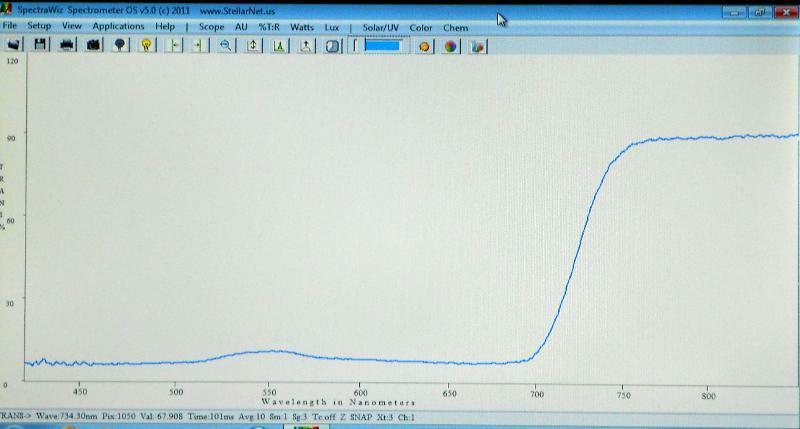 Here is a spectral absorption profile of a high nitrogen marijuana leaf (Jack Herer). You can see that about 90% of the green light is being absorbed (it’s on a 18% reflective gray card). Plants can use green light and at higher lighting levels green is more photosynthetically efficient than red. This is because the top layer of chloroplasts that contains chlorophyll becomes saturated while green can penetrate deeper in to leaf tissue (sieve effect) and reflected around until absorbed by another chloroplast containing chlorophyll (detour effect). 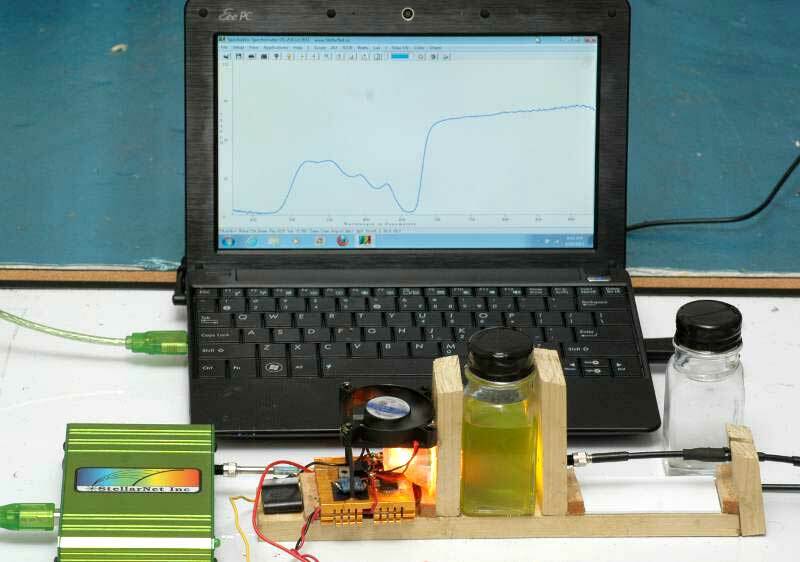 This efficiency can be measure through chlorophyll fluorescence. Green light used alone tends to cause a lot of elongation. HPS grow lights have give off a lot of green/yellow/amber light. We can use a green LED “safe light” because the two main protein groups responsible for photoperiodism regulation, the crytochrome and phytochrome proteins, are largely green light insensitive. This has nothing to do with photosynthesis. There are many more proteins involved with photoperiodism and flowering. We use a light meter to measure light intensity. Light intensity plays a very important role in photosynthesis rates. Photosynthesis rate is the major determination in our yields. To a point, more light = more yield. A light meter only determines how much light there is, not the spectrum. I showed some spectrum shots below only to illustrate a point of how our eyes and a lux meter perceives light and versus what’s closer to what a plant sees. We use this information to determine how far away we want the light source from the plant. It’s not the case that we should just try to get the plant as close to the light without burning. There are too many types of lights to use that as a rule of thumb as well as too many other variables. For example, blowing air on the light and plant will allow us to get the plant closer to a light without burning but we in the process could go above the 75000 lux point. That’s just a waste of energy since we’re now saturating the plant. For best yields per lighting levels, go with the 35000-40000 lux level. Just accept that or read below on light intensity theory. This information is not used to determine the type of light we use. For example, we generally want redder lights, which have a lower color temperature, for flowering and bluer light, which have a higher color temperature, for vegetative growth. If you want the theory why, read the photomorphogenesis sections of the lighting guide. When using a light meter, it is typically best to use it with the sensor/meter pointing straight up rather than directly at the light source. That little white semi-sphere or flat piece of plastic you see with the light meter compensates for this. What you should take away from this is that a lux meter is accurate enough to give meaningful measurements with white lighting. Here’s the conversion charts for using a lux meter as a quantum light meter. Thank you jcraw69 for pointing this link out to me! Instead of asking how much light do I need, spend $20-30 on an Ebay lux meter and get a good reading. If you use CFLs without reflectors, for example, you’ll need twice as many of them. If in doubt use 75 as a conversion number which is close enough. This means for veg growth with a white light source (more on this below) you want to be around at least 15000-20000 lux (about 200-250uMol), for flowering you want to try to hit 35000-40000 lux (about 500uMol) and the do not go over line for flowering is right around 75000 lux (about 1000uMol which is the photosynthesis saturation point). Do not use a cheap analog lux meter. I’ve tested one type and they were way off. I haven’t tested cheap digital lux meters but I’m pretty sure most are going to be close enough (the analog ones had impedance matching problems with the analog scale so were giving bad readings in brighter light). 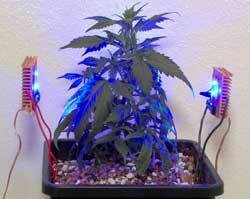 You still can not use a lux meter with LED grow lights but can with white LEDs. The conversion factor is just way too far off. 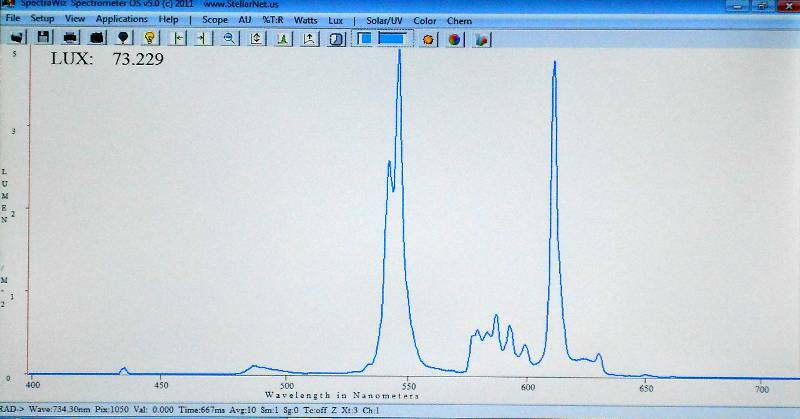 For example, as measured with my own spectrometer, a red 647nm LED was at a 10.3 conversion factor and a red 620nm LED at 44. A blue 462nm LED measured in at 12.8. When comparing two different light sources in a grow comparison, they must be done at the same lighting intensity. First, photosynthesis isn’t linear except between about 50-500 or so uMol and as you can see in the above paragraph, LEDs commonly used in grow lights give wildly different readings than white lights like HPS. Second , many plant proteins are expressed at different lighting intensities which can and will affect plant development. Third, chloroplasts can move to the side walls at higher intensities of blue light lowering plant photosynthesis efficiency. This is called cytoplasmic streaming and is done as a form of photoprotection. 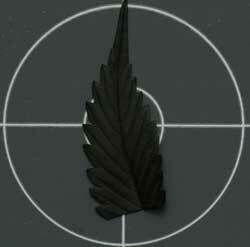 An example can be seen here in this sped up 4 second video. Here’s a few examples of light as measured in power by spectrum and how our eyes and a lux meter would perceive it. Here’s a 2700K CFL as a true spectrum and how a lux meter reads it. Notice how much the red/green (the middle and right spike) ratio changes. This is because our eyes and lux meters are much more green sensitive. Why are quantum light meters so damn expensive? Economy of scale and higher accuracy. The cheapest quantum light meter that can give true measurements with LED lighting is $800. So, I’ve argued in the past that lux meters were next to worthless as plant light meters. 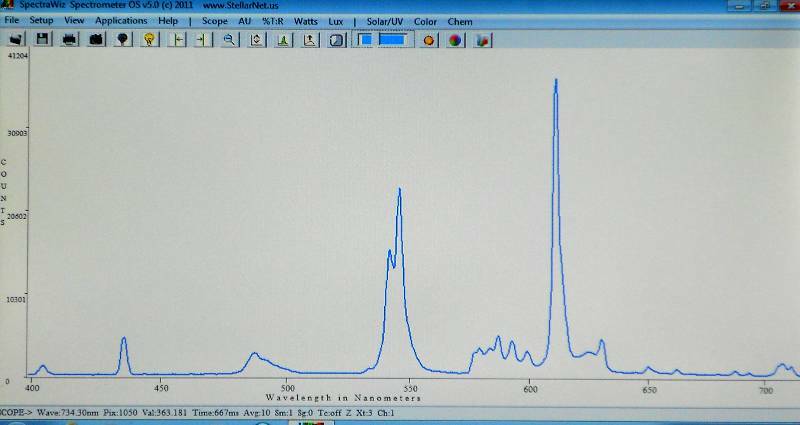 I was wrong on this point for white light and didn’t realize it until about 10 days ago when I got a spectrometer.